Baby Driver is a Hollywood action and comedy movie. Ansel Elgort is playing a leading role as Baby, who always put his headphone and keep listing song and he gets energetic and motivated for a stunning ride. Actually this movie relates to Transporter movie series in which the none other than Jason Statham is playing as a professional driver as well as good fighter but Ansel Elgort doesn’t fight very well. After watching this movie all girls and boys are liking him more and every boys want to look as cool as he is in the movie. 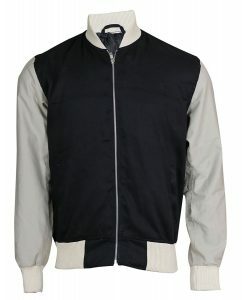 Ansel Algort is wearing varsity style bomber jacket which is getting most famous and are being offered at online. He wore this jacket in all scenes in the movie. If we talk about this Baby Driver jacket’s features then these are so cool.